Aeroflow Nitro Heaven … See what happens when you put a Supercharged Nitro Burning Hemi in a short wheelbase Hot Rod! 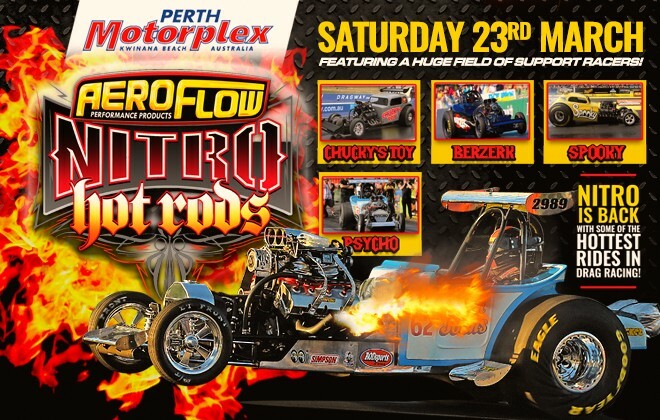 4 of the country’s baddest Fuel Altereds are coming to Perth Motorplex on Saturday 23rd March to wow your senses! The above Fan Entry Schedule is an early indicative schedule subject to minor alterations. The detailed Competitor Schedule is released the week of the event. General Admission: Terraced grass section from 400-foot mark (just beyond one-quarter mark) to 1000 foot mark (three-quarter mark). No Pit Area access. Silver Area: Terraced grass section from behind start line, adjacent to start line all the way to half-track. Includes sun shade sales on western side. Also includes access to general admission area. Pit area access included. Gold Area: Reserved premium seats in stand in front of corporate suites near start line. Only gold area members can enter stand. Also includes access to general admission and silver areas. Pit area access included. Entries / Schedule: Updated approx. week prior to event. Pit Map uploaded approx. 72 hours prior to event. Over the past 4 years the Aeroflow Outlaw Nitro Funny Car show has become one of Australia’s most popular drag racing series with its non-stop total entertainment package wowing crowds all over the country. The addition of the Aeroflow Nitro Hot Rods last year was a huge success and now those crazy machines are coming back. These 3000 horsepower Nitro burning machines that have a throwback to the early days of wild, crazy looking cars with monster motors. This show is designed with entertainment in mind from these wild and totally unpredictable machines! Psycho, Berzerk, Spooky, and Chuckys toy all have personalities and followings of their own, with each car seemingly having a different allegiance of fans. These 3000 horsepower machines are a mix of the crazy wild out of control passes that a Nitro hot rod is famous for and the reliability for these to put on a show run after run. Summer Slam, Nitro Bike, Top Comp, Super Comp, Comp Bike, Supercharged Outlaws, Top Sportsman, Outlaw Radial, Modified, Super Sedan, Modified Bike and Super Street! CHECK OUT THESE AWESOME HOT RODS!